A double Formula Ford 2000 victory for Callum Grant topped the Croft Nostalgia Weekend (August 4/5) as the Historic Sports Car Club delivered a tremendous weekend of racing at the North Yorkshire track. Alongside a raft of period attractions, displays and parades, the HSCC ran a busy 18-race programme on the popular and challenging track. 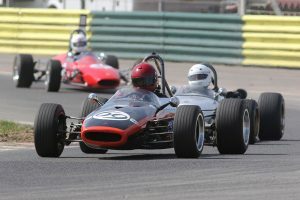 The two strands of period Formula Ford 2000 racing ran together as the Historic Formula Ford 2000 Championship and the URS Classic Formula Ford 2000 Series shared the grid. In his first races in his father’s Delta T78 since last October, Grant showed superb pace to twice head a bumper 32-car field. Nelson Rowe provided stern opposition on his return to racing after his Cadwell Park accident in May to take two second places after some tough battling, while Andrew Park starred by racing from the back of the grid to take third place in Sunday’s race. Charles Barter (Datsun 240Z) took an impressive double win in rounds eight and nine of 13 in the HSCC 70s Road Sports Championship. Jeremy Clark (Lotus Elan) and Will Leverett (Lotus Europa) led the chase of Barter in both races and each took a second place after some spirited battling in a strong and varied field. 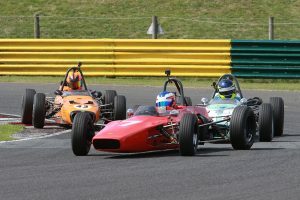 Two rounds of the HSCC Historic Formula Ford Championship were tense affairs as title rivals Cameron Jackson and Ben Mitchell went head-to-head. 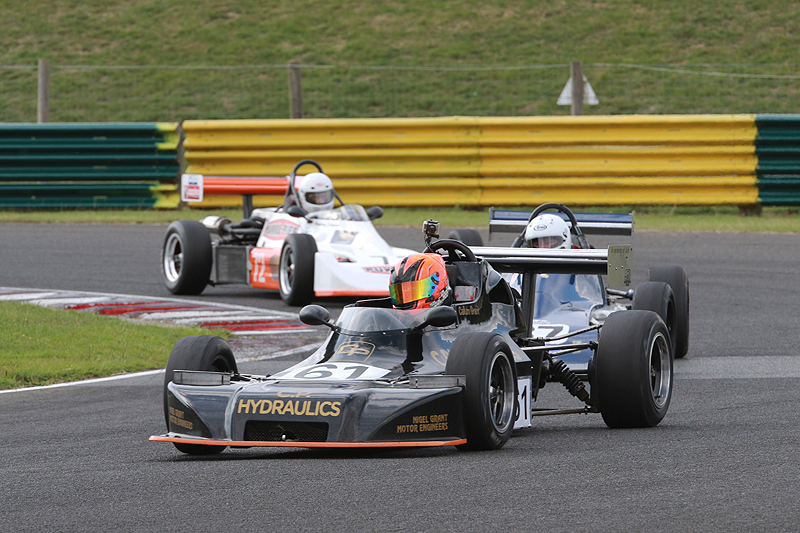 Callum Grant, now back in his FF1600 Merlyn Mk20 was right in the mix two, but eventually it was Jackson (Lola T200) who bagged both wins to pare back Mitchell’s title lead. Top of the over 50s division on Saturday was Jon Milicevic (Lola T200) in his first Formula Ford race for 24 years, while Brian Morris (Lola T200) took the honours on Sunday. Milicevic was unstoppable as the Historic Formula 3 and Formula Junior classes shared the grid for two races. His F3 Brabham B21B was clearly the class of the field as he romped to two clear wins and took a big step towards the 2018 title. Peter Thompson (Brabham BT21) was next best of the F3s but had to contend with the charging Peter de la Roche (Lola Mk3) who was clearly the Formula Junior pacesetter. Sports cars from the 1960s wowed the fans in rounds eight and nine of the HSCC Historic Road Sports Championship and it was John Davison (Lotus Elan) who flew at his favourite track to take a resounding double win. He twice stretched clear of Kevin Kivlochan (Morgan Plus 8) as Jonathan Rose had to race hard on both days to fend off the similar Lotus Elan of Larry Kennedy. Mark Charteris was in mighty form in his Mallock Mk20/21 as he took a double win in Classic Clubmans despite the best efforts of the fast-starting John Harrison in his similar car. However, in both races Charteris was able to battle ahead and pull clear while Alan Cook completed the podium in both races. Philip Hart and Clive Wood shared wins in Class B, while Trevor Welsh (Lola T492) headed the invitation class for period Sports 2000s. Richard Belcher is another driver with a real affinity for Croft and he took his Lotus Cortina to a double win in the Historic Touring Car Championship. Local racer Philip House (Lotus Cortina) chased Belcher hard in the first race but had overheating concerns and elected to miss Sunday’s race. 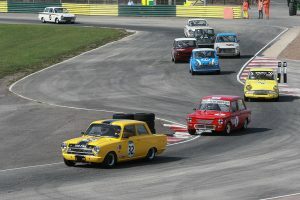 Bob Bullen worked his Ford Anglia up to second on Sunday as Steve Platts (Singer Chamois) topped the Imp pack despite a fierce challenge from Adrian Oliver. A 40-minute pit-stop race on Saturday afternoon was race five of seven in the Guards Trophy. Charles Allison fended off Philip Nelson in a battle of the Chevron B8s while the Lenham P69 of local racers John Waggitt/Peter Needham completed the podium party ahead of the Lotus 23B of Nick Fennell and Jon Milicevic. However, the race-leading Lenham would have been the winner had it not incurred a 30s penalty for taking its pit stop outside the designated window. Fennell and Milicevic took their class as Milicevic rounded out a weekend of four races and four class or overall wins. While others faltered, the Lotus Elan of Roderick and Patrick Jack came through to top the GT field. Finally, the Lackford Engineering-supported Sprite and Midget Challenge was a welcome guest race on the programme as David Morrison (Midget) claimed a double victory.